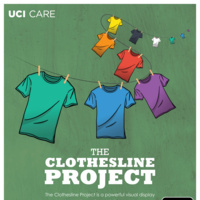 The Clothesline Project is a powerful visual display created by survivors of sexual violence to express their experiences and emotions by decorating a shirt. The shirts are hung on a clothesline to be viewed by others as testimony to illustrate the impact of sexual and domestic violence. Please be advised that this display includes descriptions of sexual and relationship violence and may be upsetting to some members of our campus community. For confidential support, please contact CARE.